In Part 1 of Jane's story, which I shared in my last blog, Jane tells us of the stroke of luck that led to the purchase of their beautiful castle, Chateau du Jonquay (above). Here is the beginning of the story again, along with a continuation of our interview. You have bought and renovated a property in France – Chateau Du Jonquay in Normandy. Why did you choose Normandy for your French home? It was more of a case of Normandy chose us! We had visited almost everywhere else in France and never had been to Normandy, when a friend invited us to come and spend a weekend with them and attend another friend of their’s annual party. It turned out the friend was a New York interior designer and his chateau was for sale. So pretty much by the end of the party Steve (my husband) had decided to buy it, as he had fallen in love with it. I liked it too but I thought we were actually looking to invest in an apartment, so it was a bit of a shock! We really did fall under Chateau Jonquay’s spell! Might there be a renovation story or two that you could share? Naturally, there are many, many renovation stories! In some ways I feel like we have been continually renovating since we bought it 9 years ago. Initially we had to replace the roof as it was leaking and we added a bathroom to the 3rd level. Then we bought the farmhouse next door when it came up for sale and renovated that. It had been the original stables to the Chateau so it was lovely to put them back as one property. Renovating the farmhouse was loads of fun as I invited 10 Australian girlfriends to come and visit, drop in and paint or restore the garden so I didn’t get lonely. It was in very bad shape, but when I look back I can’t believe how much we achieved in just 4 months. The French tradies loved turning up each day to the babble of the Aussie girls working away, up ladders, stripping back 10 layers of wallpaper, trying to explain to tradesmen that you need a wallpaper steaming machine – I'm not sure I even knew what that was in English! Our french language improved enormously, particularly the vocabulary for anything to do with renovation! We then decided to do a more major renovation on the Chateau by adding a conservatory, new la cornue kitchen, which then led to refurbishing the whole ground floor. We also added another bathroom, the list goes on. It was like opening a can of worms, literally – once we opened up the walls there were actually small animals nesting in them! 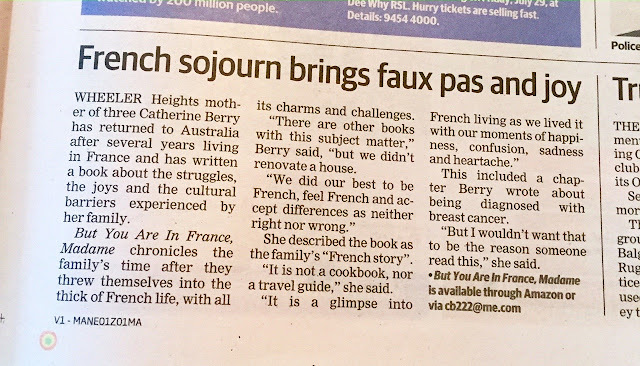 What advice would you give to other Australian families who dream of buying their own special place in France? Do you have any practical tips regarding the purchase process? I would try and buy a house that has been renovated, as they are inexpensive to purchase but to renovate is costly. It is way less expensive than Australian costs but it is still better if it has been done. Particularly bathrooms, they seem to be the hardest thing for me. Finding good tradesmen is not easy but once you do the French are wonderful to work with and in Normandy they love Australians. They cannot believe anyone would fly so far to experience living in their country! The purchase process was very easy really, but was greatly enhanced for us as my husband is very good at reading and speaking French. I would do as much homework as you can, but as a venture I highly recommend it. It has been one of the most exciting things we have done. I would also only buy if it is a secondary property and you leave enough in the budget for fixing maintenance issues, as the buildings are so old the issues are constant. I also think you need to keep a sense of humour about you otherwise you would go mad! Chateau du Jonquay (sleeps 16) and Petit Jonquay (sleeps 8) are available for holiday rental. How would those who were interested find out more? They are both available for rent either separately or together. Click here for photos, rates and information. I also offer an additional service of tailor-made itineraries for groups who would like to stay for a week with restaurant bookings and suggestions of things to do and see around Normandy. It is also available for parties. We have a lot of people who book the castle for celebrations; however, it is also really enjoyable just for families who love the heated pool is to relax around. In addition, I am very excited about a collaboration I have with Radiant Pantry on a project called Fit.Food.France. Fit.Food.France is a 5-day program of yoga, meditation, hikes, healthy French food, market tours and cooking classes with a live-in health coach. We have 2 weeks available for 2019. Are you working on any other projects at the castle? I am constantly working on projects for Jonquay, mainly because not only do I love the building (renovating is my passion) but also because I have fallen in love with Normandy as an area. We like the weather as it never gets hotter than 32 and it is very green and lush which reminds us of Melbourne. The next project is our 400-year-old cellar under the castle, that was uncovered during the last renovation. Oh, and we have a few windows to replace! Thanks so much Jane for sharing your story. Bonne continuation and good luck with fit.food.france. Let us know how it all goes. family's French story, 'But you are in France, Madame'.